When you sell a car, you don’t expect to be charged every time its new driver goes through a toll. 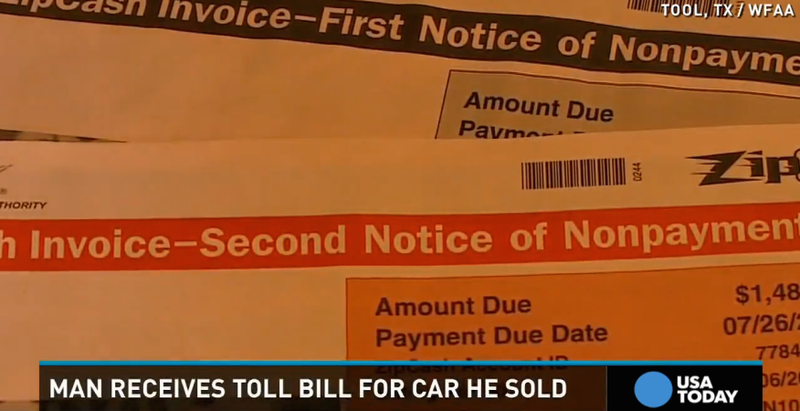 But that’s exactly what’s happened to one Texas man, who says he sold his car in a Craigslist deal two years ago: since the day after that sale closed, he’s received more than $1,500 in toll bills that he claims he shouldn’t have to pay. While this sounds unfair, there’s one major caveat in the man’s story: the thing is, he didn’t remove the license plate from the Nissan Maxima when he sold it in 2013, meaning the car’s registration was still linked to his address. He admits that he didn’t know you were supposed to take the license plate off a car before selling it, a gap in his knowledge that has made it hard for him to convince the North Texas Transit Authority that he shouldn’t be getting the toll bills. A spokesman for NTTA says by law, the agency has to send the invoice to the registered owner of the plates. And in this case, the NTTA notes, the owner didn’t complete a Vehicle Transfer Notice until October 2014, and hasn’t been able to provide the car’s bill of sale as requested. He’s learning a tough lesson he says, explaining that he’d rather go to jail and sit it out, if it comes to that. In the meantime, he’s willing to fight the bills in court.